If you return to the local birds page, there are links to more information and comments on their provisional status or present results about each bird. The following graphs give a pictorial representation of responses to birds populating new plantings. Each graph is linked to the unpublished PDF report that is presently a living document until it is finalised. In the meantime, Dr Ray Pierce has contributed to a paper published on the open access journal "Land" with a section on Envirocare's bird monitoring project sponsored by Birdlife Australia. See the publication here. Orange-footed scrubfowl and brush turkey are fairly common along the corridor especially near dwellings (note spikes in graph at Jum Rum, Myola 1 and Queens Block, all close to humans). 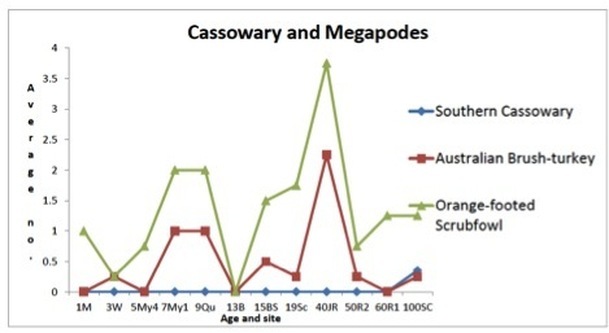 Southern cassowary, however, have been recorded only in the reference areas (Stoney Creek Rd during this survey, and Barron Reference 1 outside this sampling period). Rainforest understory birds are often the most sensitive to environmental change in the tropics. This suite in the Wet Tropics includes red-necked crakes and eastern whipbirds which have responded to some existing plantings, e.g. Myola 1 and school block, which is encouraging. However, it’s the noisy pitta and chowchilla which are clearly slow to respond to restoration projects. Return to previous page Recovery in corridors here or go to the ABEF home page here.